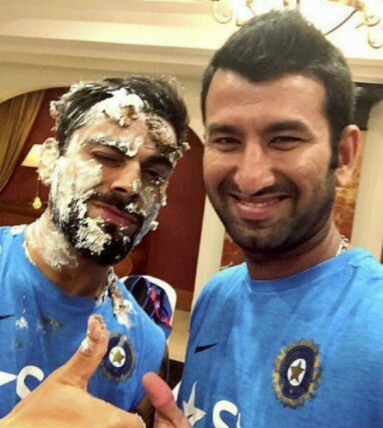 India’s test skipper and heartthrob Virat Kohli recently celebrated his 28th birthday, and to make it more special, girlfriend Anushka Sharma gave him a pleasant surprise when she joined him in his birthday celebrations with Team India and gave us a lot of cute moments and major relationship goals. Virat, who is currently in Rajkot for the five match test series against England which will start from November 9, turned 28 on November 5. Busy as he is, he cut a few cakes and celebrated with his teammates in his hotel room in Rajkot, before they were joined by Anushka. 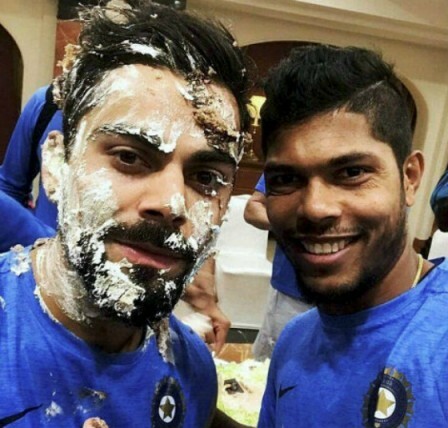 Virat was bombarded with best wishes from his fans and members of the cricket fraternity, as well as Bollywood celebrities. What’s more! As fans love ‘Virushka’ (how Virat and Anushka are fondly called), it wasn’t just the hashtag #HappyBirthdayVirat that was trending on Twitter, #HBDAnushka was also trending! After seeing the inside pictures of the birthday celebrations, Virat and Anushka have put all break-up rumors to rest as they are seen walking hand-in-hand and look completely smitten by each other. As Virat prepares for the Test series, Anushka flew back to Mumbai earlier today.